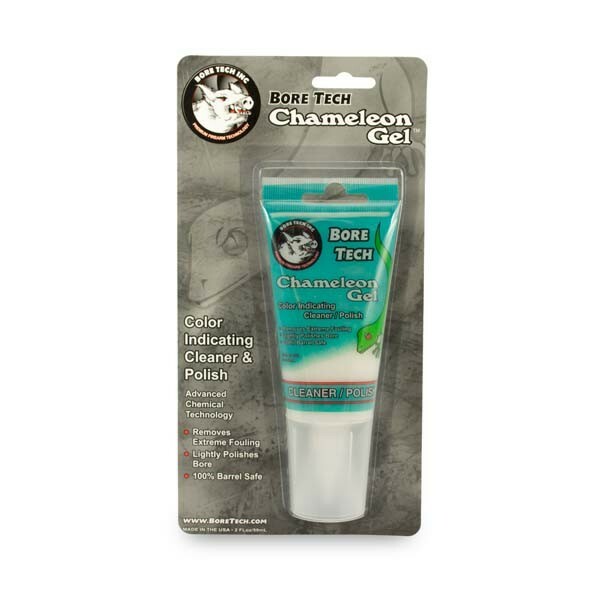 Bore Tech’s Chameleon Gel™ is a patented, high-tech, color-indicating cleaner and polish that effectively removes severe Carbon, Copper, Lead and Moly fouling. This patented chemical and mechanical cleaning technology is odor free, biodegradable and 100% safe for all barrel types. The easy to use gel formulation requires no mixing and cleans up quickly for a shiny barrel every time. 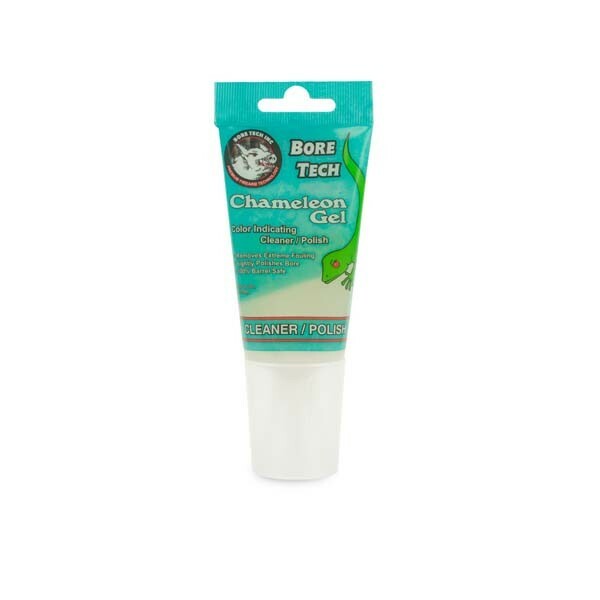 Available in a 2oz tube. Bore Tech’s Chameleon Gel™ redefined cleaning by pioneering the combination of chemical and mechanical cleaning action into a color indicating and 100% barrel safe cleaner and polish. The easy to use gel formulation effectively removes heavy Carbon, Copper, Lead and Moly fouling. It requires no mixing and cleans up quickly for a shiny barrel every time. Traditional abrasive bore pastes solely rely on aluminum oxide grit and mechanical abrasion to remove fouling. Complicating matters, this decades old technology turns black whether the barrel is copper fouled, carbon fouled or 100% clean. Shooters have no indication of their bore condition and in turn overuse the traditional bore pastes damaging their barrel. Not with Chameleon Gel! Chameleon Gel safely cleans fouling in half the time of traditional abrasive bore pastes by utilizing a micron sized, silica based polish that creates an activation site for the patented chemical technology to quickly and effectively clean. It also changes colors to show what type of fouling is in the bore and when the bore is clean. No hay video para este producto.